L & A Wrecker Service offers complete towing services and roadside assistance! Our courteous staff is here to assist you 24 hours a day, 7 days a week! "If you're looking for friendly, reliable service, you've arrived at your destination." "It's National Distracted Driving Awareness Month, and we urge you to keep your eyes on the road -- this month and each one after." "Hearing your feedback would be wheel nice. http://bit.ly/2HRBxea"
"Let's put your problems in the past." "We go the extra mile so you can get extra miles out of your car." Have had aeceral vehicles towed by L&A, and have had a good experience each time. Prices are reasonable, and the dispatchers and drivers have always been nice. I recently had a great experience with Mike. Yes, I'd like to receive news from L&A Wrecker Service. 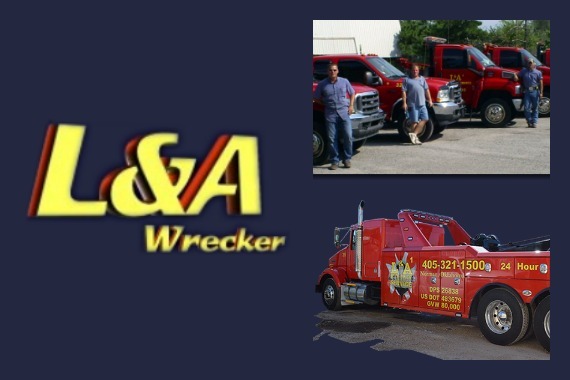 Sign up for the L&A Wrecker Service Newsletter!